Everyone likes Chinese food. And everyone has heard that the Chinese food in China is nothing like the Chinese food at home. This is not really true. The food here has many similarities. I also remember being told a romantic story of how monosodium glutamate (MSG) was added to food only in the west. This certainly isn't true. Every dish, every meal, every street stall and everybody's home kitchen, it seems, have their own little (or not so little) stash of the white crystal. Like opium in the 19th century, the Chinese are now addicted to their 'Wei Jing'. Some people may find the following pictures disturbing. 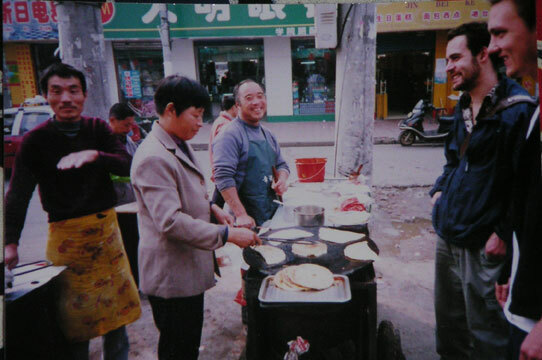 This one wasn't taken by me, but its of a street butchers in Huang Gong, a town 60km away taken by an English teacher there called Caro. All I can say is that cat lovers might quite like it. If you are a dog lover, read on and don't click here. A far trustier bet from the guess-work point of view is to go to the street stalls. Here you can generally point at what you want and see it cooked and scream at the appropriate moment to stop the MSG being added. Here are just a few of my favorites from the street food. 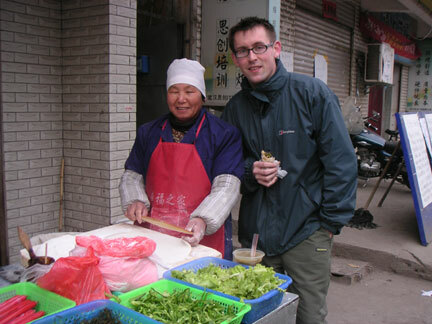 This is our favorite Jiaozi lady. Jiaozi translates as dumplings. These little guys are either fried, steamed or boiled depending on where you go. The idea is much the same throughout though. A little nugget of meat, vegetable or meat and vegetable in the middle of a pastry-type envelope. You get seven or eight for 10p and it makes a great evening snack. I've only just begun to start eating them with hot sauce. This adds quite a punch. 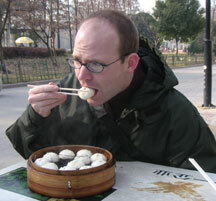 This guy knows how to make a good han'bau'bao. 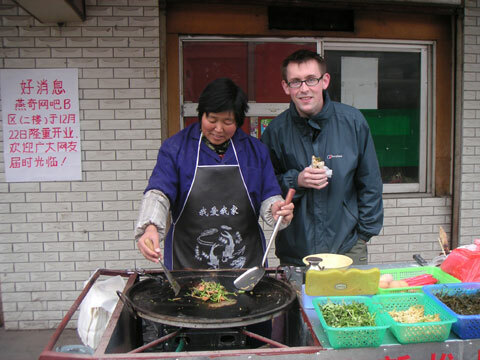 He is out there chopping up the meat and corriander all day everyday - as opposed to the Jiaozi ladies who generally only appear at about three or four o'clock in the afternoon. The 'foreign experts' are well known by the students to love this stuff. At 15p a shot you might think you can't go wrong. However, extravagant as we are, we have now decided to bargain them up so that we get 'all meat' versions rather than the mostly fat versions that we previously got. This means that we now have to stump up 20p. The ingredients themselves are pork, green pepper and corriander chopped-up together and them placed in a pita-like pocket of bread. Quite spicy but a great snack at any time of the day! Beef Chow Mein in England was always a firm favorite of mine (and my mother). 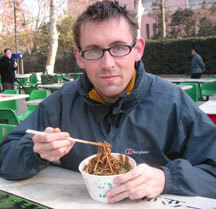 Here in China I often go for Chao Mian at lunch. There is a nice selection of different ingredients infront of these guys and pointing gets you a surprisingly long way. These guys have it easy in winter because they get to stand next to a hot wok all day long. However, in summer they don't get it so easy. When it is already 40c and very sweaty, the last job you really want is to swoosh round chicken and cucumber around a roastingly hot pan whilst stood next to a gas furnace, breathing like a dragon. A firm favorite of students. This fondue kind-of-idea is very communal and a clear affront to any health and safety inspectors who might be visiting the East. I was once asked 'Why is it called stinky tofu?' After you have walked past a stall selling it (and there are lots of them over here) you will never need to contemplate that question again. Quite the most revolting smelling food I've ever encountered. And its eaten by the bucket load. When questioned why they eat it when it smells so unuterably foul, the students just say that they like the flavour and try not to breath too much when eating it. I've never gone as far as to put any into my mouth - but James from next door. Convinced that it couldn't smell as bad as it tasted he tried it in his first week. Every now and again I hear the screams from his bedroom as he remembers the experience in his nightmares. 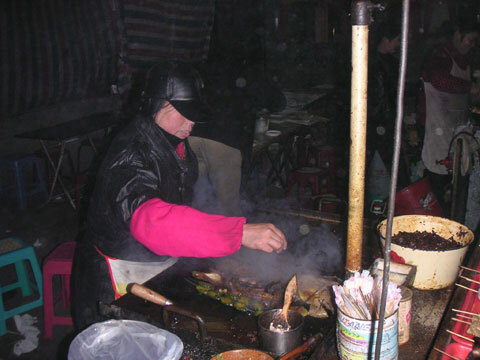 Literally "Hot, dry noodles" is a specialty of Wuhan. This is a bowl of noodles with some tasty sauces added (they look like chocolate but taste like beanpaste) Normally this is eaten for breakfast. The Chinese also particularly like it with lots of Monosodium Glutomate added.